No fewer than 60 persons were feared dead yesterday when a tanker loaded with Petroleum product fell and exploded along Odukpani LGA axis of the Ikom-calabar Highway near the Federal Housing estate, Calabar, Cross River. The victims were scooping fuel from the tanker when it went up in flames. An eyewitness, Mr Slyvester Ilem who narrated how the tragedy occurred said; “I saw people running to the scene with gallons and other containers to scoop fuel after the tanker veered off the road into a ditch by the roadside. “Police officers from Odukpani Division also tried to cordon-off the area but the people refused and continued to scoop fuel. 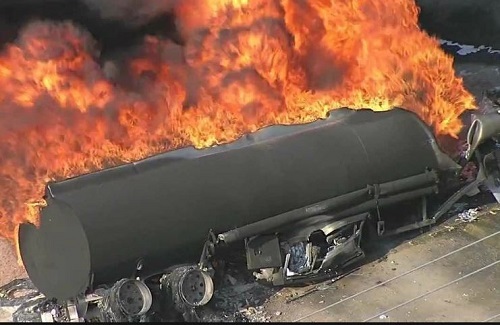 The rest is now history as the tanker burst into flames and engulfed all the people near and within the radius that the product had spread to. “Let me be modest, the people scooping that fuel will not be less than 60 to 70 people because it was like a market place,” he said. When contacted, Police Public Relations Officer, DSP Irene Ugbo confirmed the incident adding that they had earlier warned the victims who took advantage of the illegal act but they were all dead now. “Our men from Odukpani Division went there to cordon-off the area but the people refused and continued scooping fuel and before we knew it, the place was already in flames. As we speak, we cannot confirm the number of deceased persons because the fire is still heavy. It is only when the fire subsides that we can account for the victims, and give analysis of what happened there,” she said. She however condoled with the families who lost their loved ones in the tragedy.